SO, they're finally off! The announcement that even the PM admitted was unsurprising has happened and the phony campaigning can finish. And the question of the moment - which genius decided that rainbow plastic knitting needles would form the BBC's election logo?? Despite all the election hype or possibly because of it, I think my favourite quote is in Sam Wollaston's Guardian review of last night's University Challenge final - "The dude is Wikipedia with a pulse". Oh, there was some knitting, too. My Dad had a birthday on Sunday, and socks were knitted. I'm very pleased with these. They're the Maze socks [Ravelry link] from Charlene Schurch's Sensational Knitted Socks and they were very good fun to knit. 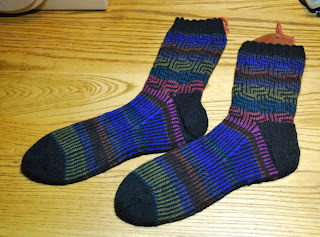 The black yarn is Hot Socks, bought in Vienna for a song last year; the self-striping is Kaffe Fassett (of course...). 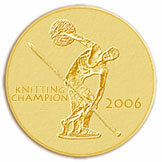 I used just under one 50g ball of the self-striping and just over one 50g ball of the black. The leg is mosaic-knitted, and the foot Fair Isle pinstripes. And apparently he really likes them. Those are great. I made Grilltech a set of them, and he loves them also!